The studio that created Tony Hawk's Pro Skater will soon be no more. According to an internal memo from Activision Publishing CEO Eric Hirshberg obtained by Giant Bomb, the 20-year-old studio is merging with Call of Duty developer Infinity Ward, and the Neversoft name is being retired. Neversoft was formed in July 1994 by Joel Jewett, Mick West and Chris Ward, three employees of Malibu Comics game division, Malibu Interactive. The studio created two games — the toy-based Skeleton Warriors and Bruce Willis-based Apocalypse — before being purchased by Activision in 1999. Since then, most of the studio's work has been centered around the Tony Hawk skateboarding franchise and Guitar Hero, which the studio took over development on when Activision purchased Red Octane in 2006. Neversoft's last release was 2010's Guitar Hero: Warriors of Rock. The seemingly stagnant studio was tapped last year to provide support for Infinity Ward, developing the Extinction Mode for Call of Duty: Ghosts. "As you know, Neversoft and Infinity Ward teamed up for the development of Call of Duty: Ghosts," wrote Hirshberg. "And through that process, it became clear that the two studios have very complementary skill sets. Between these two excellent studios, it seemed like a single 'super-studio' could emerge." That single "super-studio" will keep the name Infinity Ward, due to its close ties with one of Activision's most important franchises. 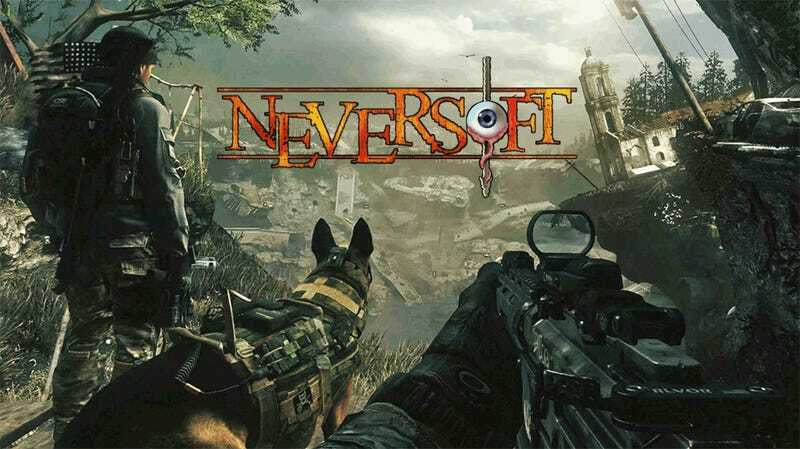 According to the memo, Neversoft co-founder and studio head Joel Jewett and studio director Scott Pease will be retiring from game development following the merger, staying on long enough to help ease the transition for the rest of the Neversoft team. The newly-merged studio will be run by current executive vice president of Activision worldwide studios Dave Stohl. Current Infinity Ward studio head Steve Ackrich will maintain a leadership role in the new studio. They're calling it a merger, but to me it feels like the end of an era and the death of a 20-year-old game studio that's brought me many a good time. We've reached out to Activision for comment on the situation, and will update the post should the company respond. UPDATE: Infinity Ward has confirmed the merger via its official Twitter account.